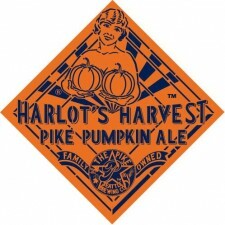 (Seattle, WA) – Introduced for the first time last year to one of the best receptions in Pike Brewing’s history, we doubled production in an attempt to satisfy demand. Now available on draft and in 22 oz. “dinner-size” bottles, Harlot’s Harvest is deep dark nut brown with pumpkin-colored highlights. The mouth-feel is rich and luscious. It is big, bold, and voluptuous, with a smooth sweetness reminiscent of pumpkin pie spices and the boldness of a monastic style double ale. Savor it naked or clothed in the bounty of the season! Just right for roasts, turkey, beef, ham and the festive vegetables that go with them. Organic Pils, Organic Pale, Special B, Vienna, Organic Caramel, Crystal and Chocolate malts. Spices: Brewed with organic pumpkin puree from Stahlbush Farms in Corvalis, OR, organic brown sugar, organic cane sugar, cinnamon, allspice, vanilla bean, nutmeg, ginger and clove. What is Alaskan Brewing Sending to GABF 2013? GABF 2013 – What Will Lagunitas Brewing Be Pouring?